At Mayfield, we believe that English skills are important for children’s education and their future lives. Reading and writing are useful and pleasurable activities, which benefit our children culturally, emotionally, intellectually, socially and spiritually. How is reading taught at Mayfield? How is writing taught at Mayfield? In Mayfield, children are taught to read as a class, in small groups, and 1:1 with an adult. The programmes of study for reading consist of two dimensions: word reading and comprehension. At Mayfield, we think that comprehension can be further broken down into two areas – a surface-level understanding of words and texts, and a more in-depth understanding which relies on inference and making connections within and between texts. In each year, children build on past learning to develop as readers, and explore a wide range of texts along the way. 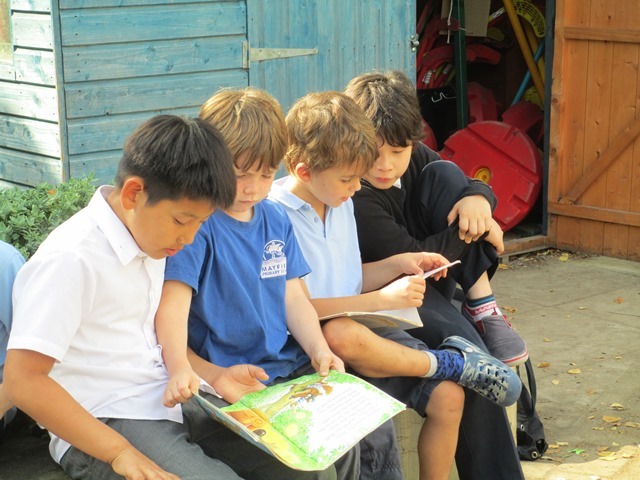 We love listening to stories, and all children regularly hear and discuss books which are read to the whole class. In Mayfield, we also use reading to model, inform, and inspire writing. When children are exploring a particular text type, they begin by reading examples of that text to help them understand the structure and techniques used by real writers. This could be about seeing how writers use organisational features to make instructions clear to follow, or it could be understanding how a novelist selects verbs which give the reader clues about how characters are feeling. We frequently use our reading skills to research information for writing in English lessons, and in other subjects across the curriculum. Reading is a tool which helps us to learn in every area! When children are excited by a text, that excitement translates into great writing! 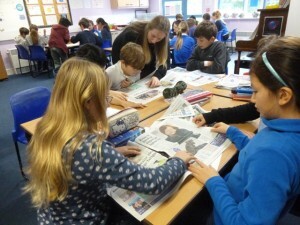 For instance, in Year 5, children use their reading of Beowulf to inspire their own Anglo-Saxon stories. Every regularly reads in a small group with a teacher. In this guided session, they focus on discussing different kinds of texts, and children’s specific learning needs are addressed. They then have the opportunity to carry out follow-up activities independently in their reading journals. Children are expected to read regularly at home, but also have opportunities for 1:1 reading in school. Children who have particular targets which cannot be easily addressed in a group session are a particular focus for 1:1 reading. 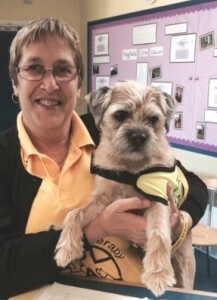 Some children have also been reading to our Reading Dog, Smidge! We are lucky to have our very own reading teacher, Mrs Barnes, who works with children across the school. Children in Years 1,2, and 3 are paired with an older child with whom they read regularly. This is a fun opportunity to share books together, and to share experiences of reading for pleasure. We have a brilliant library, and a wonderful librarian called Miss Patterson. Our library is well stocked with a range of brilliant books from a wide variety of genres. It is a great space for learning, and for enjoying books. 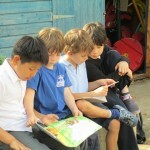 Classes regularly use the library, and children are encouraged to borrow books to read in school and to take home. The library is open at lunch times, and each year group has a slot for borrowing books and using the computers, as well as for different clubs. Mayfield Library is open after school two days a week for parents and carers who wish to borrow books, use the space for reading with their child, or to use the computers. 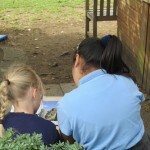 At Mayfield Primary School, we believe that reading should be a fundamental part of childhood and a skill which should be developed to support lifelong learning. Inspiring children to read is morally important and is their fundamental right. It underpins all learning and secures a good trajectory for personal development, understanding the world in which they live. • the school will engage and support parents in enabling access to a full range of reading experiences. • professional development and support for teachers will be provided to allow them to explore the huge range of printed and electronic reading materials available and to enable them to support children in their reading choices. We love celebrating reading at Mayfield, and every year we have a themed week to celebrate reading and writing. In the past, we have had a Shakespeare themed week, a myth themed week, and a week themed around a visiting author. During reading week, we have loads of different activities, including bedtime stories after school. This year, we will be celebrating poetry in its many forms with a special week in October! 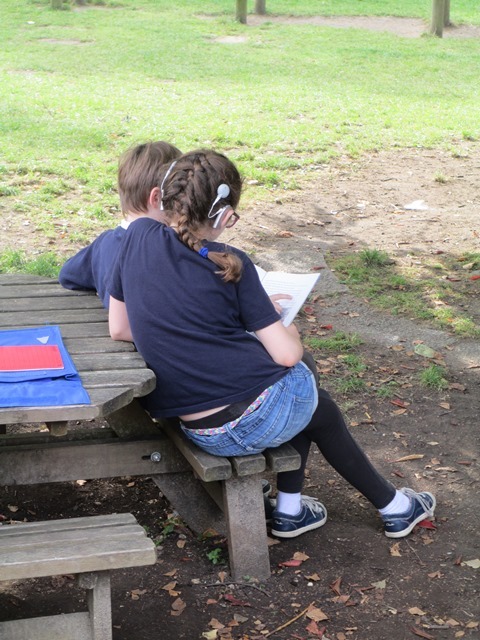 We had an extreme reading competition, where children thought creatively about different places they could read. 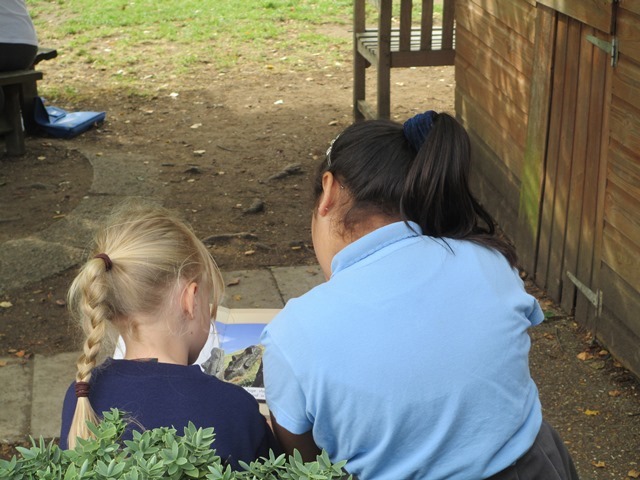 Children love reading in our Reading Tree House at lunch time, with their book buddies, or in small groups during lesson time! The Mayfield Reading Bus is an exciting space where children can go at lunchtimes to read, or with their book buddies. Children also use the Reading Bus as part of their “Out and About” sessions. 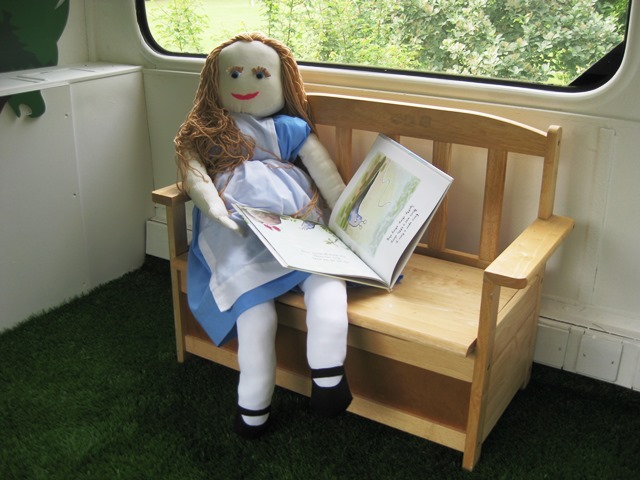 With its Alice in Wonderland theme, including a grass carpet on the top deck, our children love to climb aboard and read! We encourage every child in our school to be a member of Cambridgeshire libraries so that they can use this valuable resource throughout the year. We also have reading clubs at Mayfield, including lunchtime stories in the library, and Golden Time reading clubs. Dyslexia is a common specific learning difficulty which can cause problems with reading, writing and spelling. It is likely to be present at birth and to be lifelong in its effects. The dyslexic brain processes written and spoken information differently. Sometimes the information is forgotten, jumbled up or bits are missing. Intelligence is not affected. It makes learning to read and write much harder and can also cause difficultly with organisation, maths and memory. Dyslexic children need to discover self belief and determination to succeed to give them the mental strength to get through school. Every person is slightly different depending upon what sort of dyslexia they have. What to do if you think your child is dyslexic? Signs of dyslexia usually become apparent when a child starts school and begins to focus more on learning how to read and write. A person with dyslexia may read and write very slowly, often confuse the order of letters in words, put letters the wrong way round and have poor or inconsistent spelling. Processing of information can be affected so that dyslexics often understand verbal instructions better then information that is written down. Planning and organisation and anything that requires the use of short term memory can also be a struggle. Speak to your child’s teacher. They will be able to talk with you and address any concerns that you may have. They will be able to offer additional support to help your child if necessary and there are resources that the teacher can try such as coloured overlays and other reading aids. It is very useful for your child’s teacher to know if dyslexia runs in the family. Make sure your child has regular eye tests and discuss any concerns with the optician with regards to dyslexia and visual stress. Mayfield wishes to take the fear out of school for children with dyslexia; many of whom, if not correctly and expertly helped can feel alienated and disorientated with an increased risk of becoming disinterested in education. Mayfield ensures teaching is multi-sensory; something that benefits ALL children, not just those with dyslexia. School library – the school library has a dedicated ‘dyslexia’ section with books chosen specifically for their dyslexic friendly style. Reading teacher – Rachel Barnes is currently undertaking training to support children with dyslexic tendencies and specifically works with children who need extra support with their reading fluency. Parent group – a group of parents with dyslexic children both at Mayfield and at local secondary schools meet once a term. The aim of the group is to provide support to each other to help their children. Topics covered include book sharing, website recommendations, visual aids, tutor contacts etc. Please contact lottiespires@hotmail.com if you would like more information. Dyslexia can be seen as an advantage, some even say it’s a Super Power! Children at Mayfield are taught to write in their English lessons and as part of other subjects. Most writing teaching takes the form of whole class learning, though teachers also work with small groups and some children receive extra small-group or 1:1 support. At Mayfield, we teach children to become technically competent and imaginative writers, with the necessary skills to write for enjoyment and for a purpose. The programmes of study for writing consist of two dimensions: transcription (spelling and handwriting) and composition (articulating ideas and structuring them in speech and writing). Children learn the formation of individual letters in Foundation Stage, but also how to join digraphs which supports their recognition of phonemes in reading as well as their developing handwriting. In Year 1, children continue to consolidate their work from Foundation Stage, becoming increasingly fluent writers, and joining graphemes as their learn them. In Year 2, children begin to use pen and start to join their handwriting in whole words. By the end of Year 3, children should be joining their writing in all their work, increasing its legibility, consistency, and quality as they move into Year 4. In Year 5, children are expected to write increasingly quickly while still maintaining the quality of their writing, and by the end of Year 6, children should be making conscious choices about the way they write and the tools they write with. Children in Key Stage 2 have access to a range of lunch time, after school, and golden time clubs which include activities such as calligraphy or poetry writing. We often enter writing competitions, within our cluster of schools and more widely.